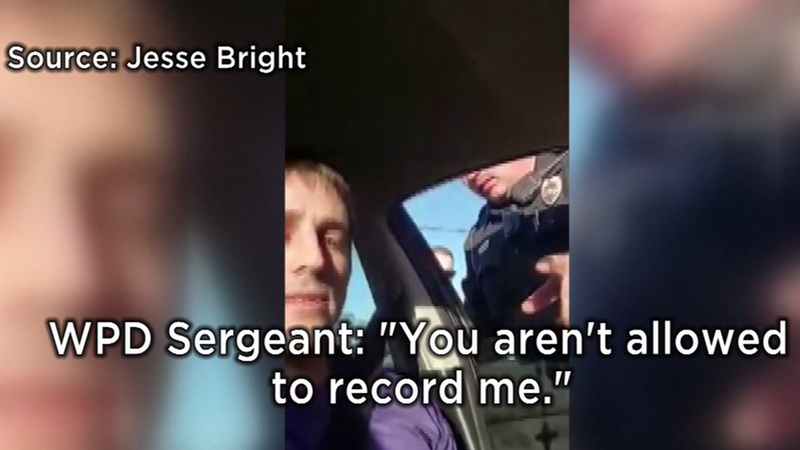 WILMINGTON, North Carolina (WABC) -- A North Carolina police officer has been demoted after he was caught on camera telling an Uber driver he could not record a traffic stop. Local news outlets report police records show that Wilmington police Sgt. Kenneth Becker was demoted to corporal Wednesday. The demotion costs Becker $1.38 an hour. The incident between Becker and Uber driver Jesse Bright was recorded last month. Bright is also an attorney in Wilmington. Officer: "Hey bud, turn that off, OK?" Bright: "No, I'll keep recording, thank you. It's my right." Officer: "Don't record me. You got me?" Bright: "Look, you're a police officer on duty. I can record you." Officer: "Be careful because there is a new law. Turn it off or I'll take you to jail." Bright: "For recording you? What is the law?" Officer: "Step out of the car." Bright: "What are you arresting me for? I'm sitting here in my car. I'm just recording in case anything happens. I'm surrounded by five police officers." Officer: "You're being a jerk." Bright: "I'm scared right now. I'm not being a jerk. I'm recording in case anything happens." Officer: "You better hope we don't find something in your car." Bright said after a deputy with a search dog was called, he also asked the deputy if recording was illegal and says the deputy also told him it was. Bright was stopped after leaving with a passenger from a home. Bright says he and his passenger and vehicle were searched under protest, and officers found nothing. No one was arrested. Shortly after the video was revealed, Wilmington Police Chief Ralph Evangelous and New Hanover County Sheriff Ed McMahon issued statements saying filming law enforcement is legal and encouraged. Police spokeswoman Linda Thompson said an investigation of the incident was closed Thursday. She could not say whether the demotion was directly related to the investigation. Becker has been with the department 17 years.